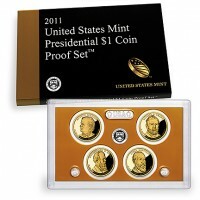 The 2011 United States Mint Presidential $1 Coin Proof Set™ will be the fifth year in which the US Mint has created a proof set containing solely the Presidential Dollars issued in that year. Each set will contain a total of four coins, all struck to proof quality at the US Mint’s facility in San Francisco. The coins will honor the 17th through the 20th Presidents of the United States – Andrew Johnson, Ulysses S. Grant, Rutherford B. Hayes and James A. Garfield. The program debuted in 2007 with the George Washington Presidential Dollar. Since then, the Mint has released a total of four Presidential Coins per year released in the order in which the Presidents served in office. All four coins will come encased in a protective lens to protect their finish. Presidential Dollar Coins are typically struck for circulation. However, the Mint strikes these proof quality coins solely for collectors who tend to prefer the mirror-like background finish. The 2011 Presidential Proof Set was released on February 22, 2011. An issue price for the Proof Set is listed at $19.95. The coins included in this set were struck at the US Mint’s facility in San Francisco. Don Everhart designed the image of the Statue of Liberty that is showcased on the reverse of all of the Presidential $1 Coins. The obverse will showcase a portrait of the honored former President of the United States.